Writing from the end of WWI through to 1949, Theosophist Alice Bailey was concerned for the well-being of the whole of humanity. She saw the rise of fascism in Europe as an evil that must be abated. She could see that dark forces were afoot on the planet, and believed that these forces were fundamentally materialistic and that for humanity to free itself from their vice-like grip, each individual must learn to recognise and learn to dispel glamour and illusion; learn that the nature of evil is selfishness, with all the associated greed and lust for power. Individuals must train themselves to avoid all selfishness, serve humanity and exercise goodwill. And train in the creation of thought-forms (ideas, concepts, theories) that would help to raise awareness and benefit humanity. Finally, Alice Bailey placed great faith in the United Nations as the single global humanitarian vehicle in the service of human and planetary betterment. What has happened to her work today? 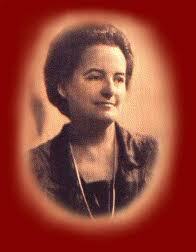 Setting aside her followers who continue to practice and apply her teachings, often behind the scenes; Alice Bailey, for example, inspiring founder of Transpersonal Psychology Roberto Assagioli who was a Secretary of her Arcane School of Esoteric Practice. Setting aside too those bloggers and commentators who follow on from evangelical Christian, Constance Cumbey, whose work, Hidden Dangers of the Rainbow (Huntington House, 1983) I and others have discredited on the grounds of poor scholarship and false claims. Commentators such as Cumbey persist in denigrating Bailey’s teachings, largely by aligning her work with the anti-Christ. It would seem that Alice Bailey’s teachings are being used elsewhere in text-book fashion, not for the purposes they were intended but to bring about conditions such as those depicted in the works from Orwell and Kafka. In other words to foster not spiritual enlightenment but a blanket of darkness, making full use of her notion of the manifestation and function of glamour and illusion. We are living therefore in an era of lies, where a thing is in reality its own other, its opposite. Nowhere is this more apparent than in the various think tanks from the Heartland Institute to Australia’s Institute of Public Affairs, dedicated to producing propaganda, lies and spin, misinformation, disinformation, to perpetuating ideology and, most insidious of all, to the appropriation and systematic undermining of critical concepts aligned to thought-forms seeking human and planetary betterment, words with enormous conceptual power, including inclusivity, interconnectedness, empowerment and sustainability. In essence through these think tanks the creation of glamour and illusion is all-pervasive and hugely successful, aided and abetted as it is by the mainstream media. The United Nations, for Bailey humanity’s greatest hope, seems to have been reduced to a front organisation designed to perpetuate the myth of humanitarianism and progress. As a front it perpetuates gloss, an illusion without substance, a far-reaching veil behind which the reality of power, addicted to a cult of violent destruction, resides. Evidenced in the use made of glamorous celebrity figures such as Hollywood actress Angelina Jolie, 2001 UNHCR Goodwill Ambassador, in April 2012 appointed as Special Envoy of UN High Commissioner for Refugees António Guterres, and now appealing to United Nations Security Council to stop sexual violence in war zones. The placement of Hollywood celebrities in key positions of humanitarian advocacy to my mind runs parallel with Gucci (part of global corporation Kering) funding a Beyonce-fronted campaign for the empowerment of women as part of their Chime for Change. Both create a superficial gloss; packaging, corporatising or otherwise obfuscating in careful speeches and touching images the extremely unpalatable, and in so doing, reinforcing that it is the elite who will foster human betterment, thus stealing the ground from the vast cohort of at-the-coal-face activists. Exacerbating an already dire situation, a veil of narcissism has descended on our planet. Constructed in the 1950s, largely through such institutions as Hollywood, the internalisation of narcissism is so successful, so aligned and intertwined with consumerism and the entire neoliberal capitalist project that few can successfully wrest themselves from its grasp. We have entered the New Age of opinion, where every voice, no matter how ill-formed, is of greater import than a singular voice of wisdom. Put simply, it would appear that Alice Bailey’s books have been opened by the wrong hands. She would call these hands the Black Lodge, her work, seeking to establish the conditions for the emergence on our planet of the White Lodge, or Spiritual Hierarchy as depicted in The Externalisation of the Hierarchy (Lucis Trust, 1957). Next Post …the Forces of Darkness.